Of the more than 900 plant species that have been catalogued within the national park boundary, 38 are protected and 43 recognised as noteworthy. 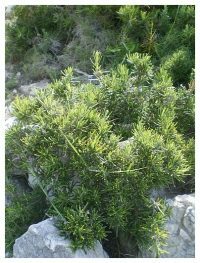 More generally, the Mediterranean scrub may be divided into tall scrub, with well-developed trees that can provide shade and humidity to the undergrowth, and short scrub, made up of impassable shrubs and bushes, called garrigue. 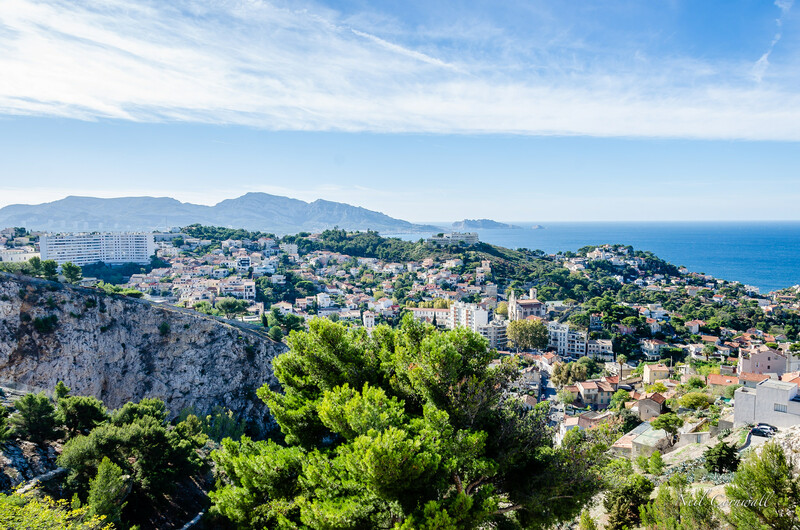 This biome contains evergreen broad-leaved and aciform trees, including: holm oaks, arbutuses, olive trees, laurels, carob trees, pine trees, junipers, cypresses and others. It also includes shrubby plants, for instance rock roses, mastic trees, myrtle and rosemary. We can add to this landscape, the shoreline is home to many halotolerant plants, species that can withstand the saltiness of the seaspray. The most typical plants are those that can stay in a dormant, resting, state during the hot summer, to sprout and grow in colder autumn temperatures. Autumn germination can take place only after a mild wet season, during which the seed becomes “acclimatised”. Later on, the seed will bloom and bear fruit in the warmth of springtime. A different strategy is implemented by geophytic or bulb plants: these perennial plants resist the summer heat through their underground bulbs and tubers, as many liliaceous plants do. Shrubs may be evergreen or shed their leaves during the driest seasons. 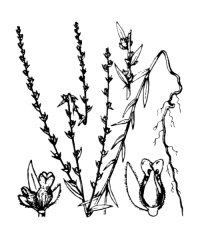 Many plants contain scented aromatic substances which deter animals who feed on them and, in some instances (for instance the Californian artemisia) these substances prevent competing plants from sprouting and growing. 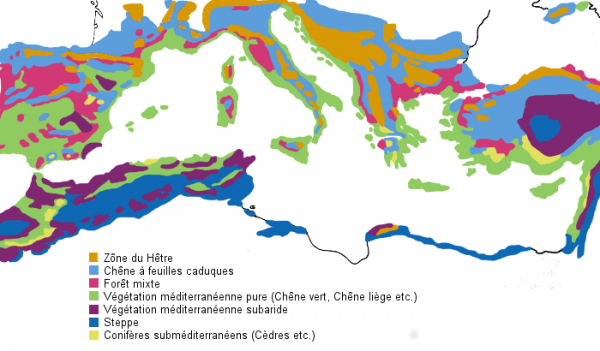 Both Garrigue and Maquis are associated with the Mediterranean climate within the Mediterranean region. The main difference is that Maquis is associated with siliceous soils (acid) while Garrigue usually refer to calcareous soils (alkaline). So, the flora the Calanques and most of the Provence landscape can be called Grarigue. Garrigue is discontinuous with widely spaced bush associations with open spaces, and is often extensive. It is associated with limestone and base rich soils, and calcium associated plants. 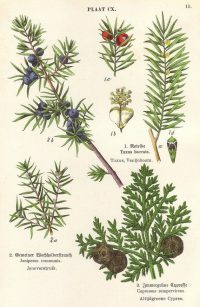 The singular word garrigue is borrowed from the Provençal dialect of Occitan garriga, equivalent to old French jarrie. These words refer to a same stem related to “rock”. 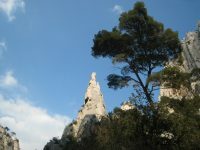 The silhouettes of Aleppo pines (Pinus halepensis – Pin d’Alep)– tower over the scrub in many places, their branches often twisted from exposure to the strong winds. Pinus halepensis, commonly known as the Aleppo pine, is generally found at low altitudes, mostly from sea level to 200 m (660 ft), but can grow up to 1,000 m (3,300 ft) in southern Spain, well over 1,200 m (3,900 ft) on Crete, and up to 1,700 m (5,600 ft) in the south, in Morocco, Algeria and Tunisia. The tree is able to quickly colonize open and disturbed areas. It can grow on all substrates and almost in all bioclimates in the Mediterranean. 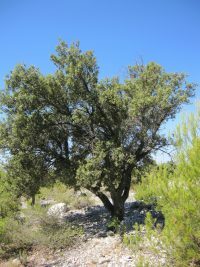 Although it is a local species, some argue that the historical replacement of natural oak maquis shrubland and garrigue with tall stands of pine has created « ecological deserts » and has significantly changed the species assemblage of these regions. The Aleppo pine is considered an invasive species though useful in South Africa; in South Australia, a control program is in place on Eyre Peninsula. It was formerly exploited for its resin (gemmage), which was used to produce the essence of turpentine. It is used today mainly for pulp, firewood (in pads) or for outdoor furniture. This large pine tree is home to a large fauna, including the short-lived White-winged Circaète Jean-le-Blanc, the red squirrel that eats its seeds or the cicadas that in summer cymbal on its trunk or branches. 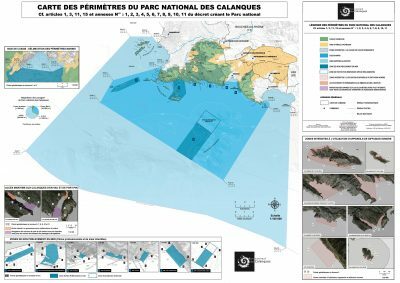 There are few in the Calanques. 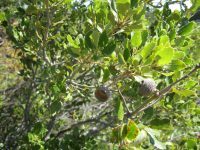 Holm oak is an evergreen broadleaf tree native to the Mediterranean region. 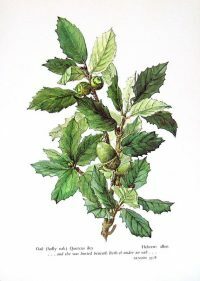 holm oak is also known as ‘holly oak’, and its botanical name, Quercus ilex, refers to its similarity to holly, which is in the Ilex genus. After pollination by wind, female flowers develop into acorns, which are smaller and have a more pointed tip than those of English or sessile oaks. Young acorns are green and mature to a dark red-brown before falling. In ancient Greece the leaves of the holm oak were used to tell the future and they were also used to make crowns to honour people. The acorn was seen as a sign of fertility and wearing acorn jewellery was believed to increase fertility. In Greek lore, the primitive tribes of Arkadia were said to have lived on a stable diet of acorns. Holm oak timber is incredibly hard and strong. 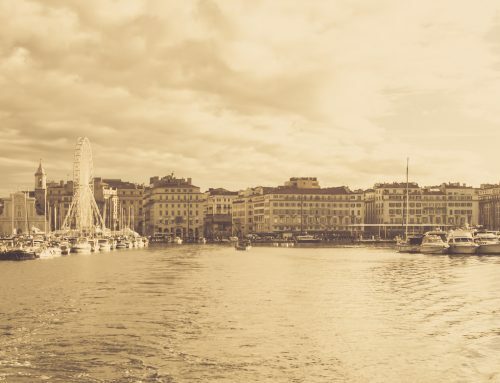 The Romans used the wood for making the wheels of carts and carriages, as well as agricultural tools. Today it is sometimes used for firewood as it is slow and long lasting. Holm oak acorns are used to feed pigs reared for Iberico ham. Lentisk (Pistacia lentiscus- Pistachier Lentisque) is a typical plant of the shrub. It is an evergreen shrub, measuring up to 3 metres tall (rarely 6-8 metres), giving off a heavy resinous scent. Its leaves are composed of 8-10 (6-12) pairs of oval, leathery and glossy leaflets. Its flowers are small, red-brown or yellow in colour. Its drupes, which are the size of small peas, are red, then they turn black when ripe. A resin is extracted from its trunk by letting it flow out of cuts in its bark; it is used as a resin to chew or as a sealant. Its wood is excellent as coal fuel. The oil extracted from its fruit is used as lamp oil or in the food industry. Mastic gum is principally used either as a flavouring or for its gum properties, as in mastic chewing gum. As a spice, it continues to be used in Greece to flavour spirits and liqueurs (such as Chios’s native drink Mastiha), chewing gum, and a number of cakes, pastries, spoon sweets, and desserts. They are used in the manufacture of an antiseptic oil. 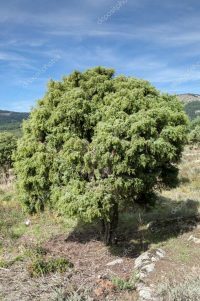 The juniper can form in either impenetrable thickets or in normal tree configuration up to 8 metres high. Its green needles are grouped in threes, presenting two white furrows; this differentiates it from the continental juniper. 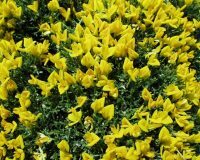 The native broom Lobel’s woadwaxen (Genista lobelia – Genêt de Lobel) can be found along the crag tops and among the scree. 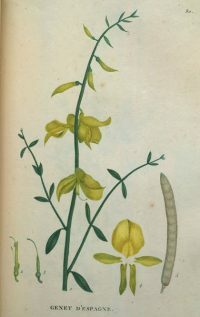 The prefix Gen refer to a shrub and Lobel refer to the flemish medicine and botanist Mathias de l’Obel. 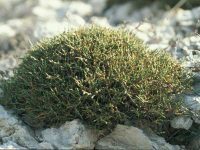 Its cushion shape allows this small, spiny shrub to withstand the wind. 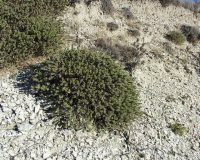 One example is rosemary (Rosmarinus officinalis), an aromatic shrub whose height varies from few centimetres to 1.50 m, with small green and neat leaves. It can commonly be found in the scrub near the sea. 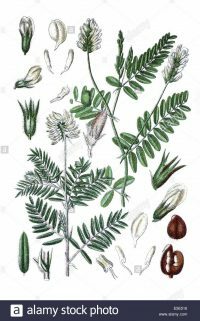 The whole plant secretes a type of oil that gives off a pleasant resinous scent, which in France is used in perfumery to make eau de Cologne. Its twigs steeped in alcohol can be used to treat joint and muscle pains. 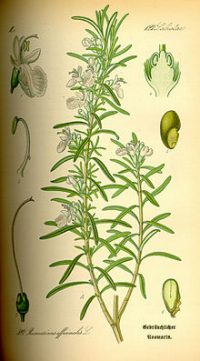 Rosemary is commonly used as a spice in roasts, sausages, rice and traditional cakes. 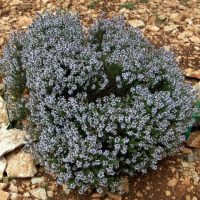 Thyme is an aromatic perennial evergreen herb with culinary, medicinal, and ornamental uses. The most common variety is Thymus vulgaris. Thyme is of the genus Thymus of the mint family (Lamiaceae), and a relative of the oregano genus Origanum. It is used to treat liver problems and is a powerful antiseptic. Its stems have the consistency and appearance of dried wood. Its very small leaves have no petiole but are connected directly to branches; its roots are not adventitious (new roots are not formed from branches that touch the ground). It is a common component of the bouquet garni, and of herbes de Provence. 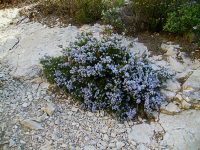 forms in spring, a dense cover over the garrigue producing pink and white flowers and is very resistant to fire. Cistus (from the Greek kistos) is a genus of flowering plants in the rockrose family Cistaceae, containing about 20 species (Ellul et al. 2002). They are perennial shrubs found on dry or rocky soils throughout the Mediterranean region, from Morocco and Portugal through to the Middle East, and also on the Canary Islands. 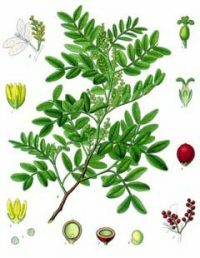 The leaves are evergreen, opposite, simple, usually slightly rough-surfaced, 2–8 cm long. In a few species (notably C. ladanifer), the leaves are coated with a highly aromatic resin called labdanum. In popular medicine, infusions of cistuses are used to treat diarrhea. Cistus creticus specifically is traditionally used for cold, flu, respiratory tract infections. Petals from the flowers of several species of Cistus are the basis of Chanel No. 5 perfume. It is recommended for worm problems. 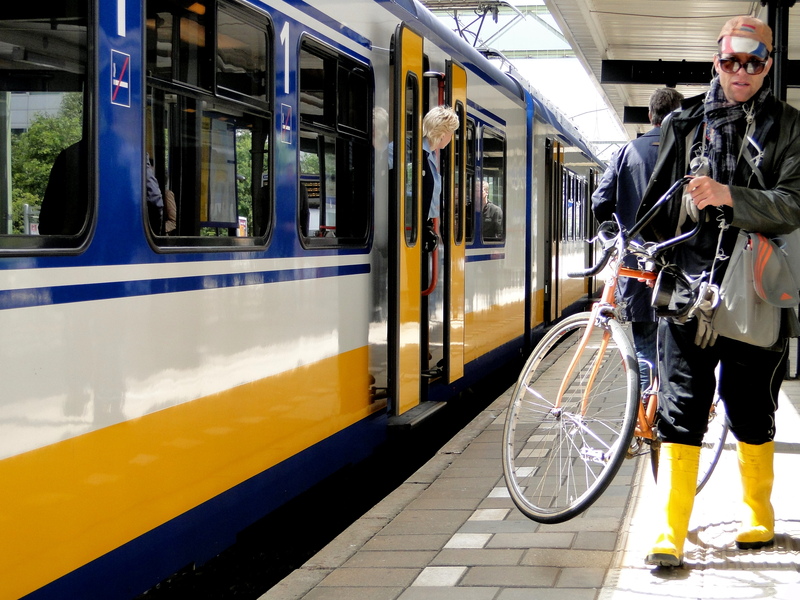 Its fibres can be used to produce a durable canvas-like fabric which can compete with those made from hemp or flax, and its twigs, when soaked, can be used to make rope. It has a long history of medicinal and culinary use, and in modern times as an ornamental garden plant. 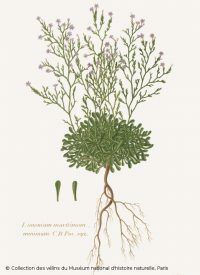 The common name « sage » is also used for a number of related and unrelated species. 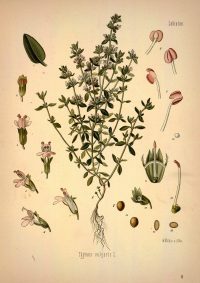 The specific epithet officinalis refers to plants with a well-established medicinal or culinary value. 10% of the world flora biodiversity is present along mediteranean sea although this area is only 1.6% of the earth surface. The seaside of the National park is particularly rich, diverse and yet unknown to the public. Since thousands of years, the species have adapted to the extreme conditions of their environment such as high winds (135 days by year on average), drought, salt, poor soil and superficial. 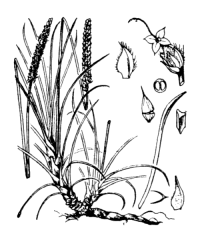 anemomorphosis (modification of the shape of the plant under the effect of the wind). In recent decades, new constraints of anthropic origin (linked to humans) are attacking the flora of the coastline: urbanization of the coast, pollution caused by spray, frequentation causing the fragmentation of environments, gathering, campfire, invasive plants. As users of the National Park, we have the responsibility to preserve each of the habitats and species that compose it. Also called Sea Lavender, this little purple bloom is Provence endemic. Althought its small size, it have deep roots into the cracks of the coastal rocks. 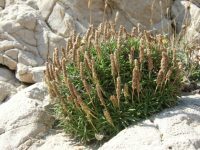 Like many Mediterranean plants, the spines serve as protection against ruminants (goats, sheep, donkeys …) and they also limit the loss of water by evaporation in hot climates. . The astragalus then perfectly supports drought and salt. 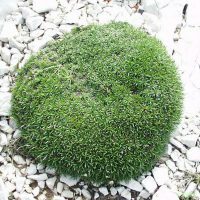 The plant has also adapted by taking a very compact form and cushion. It’s a great strategy to keep some moisture and freshness. 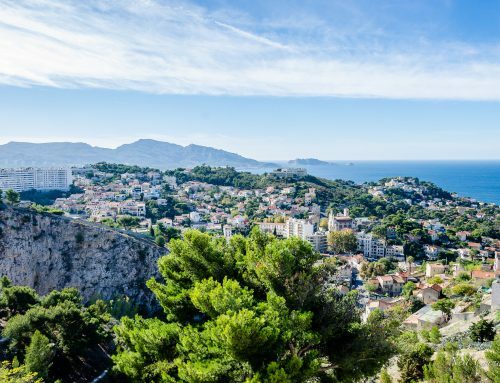 This shape and its thorns is worth to be called the « Cushion of Belle Mère » on the side of Marseille! It is found on sandy soils and rocky coast Var, Bouches du Rhone, Corsica and Spain, in very few places in the end. It is endemic (presence of this species in the world only in a limited geographical area). It is on the red list of species of French flora. It is protected and considered vulnerable internationally. Forming small shrubs, this plant protected has leaves covered with silky hairs giving a characteristic gray-green hue. The french name come from the sparrow bird who feed from the seeds of the plant. 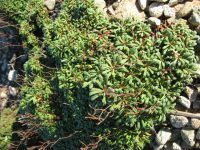 This plant with narrow leaves forms dense turf and pads on the littoral rocks. The Latin name evokes the fact that this plant grows where we walk. However, the plant is threatened, like many others, by trampling, urbanization and coastal pollution.